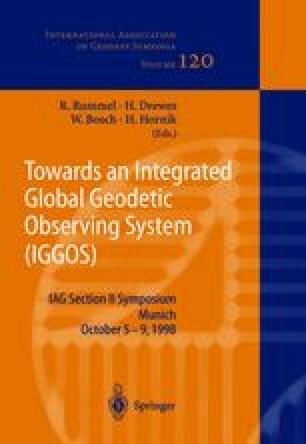 The modelling of satellite orbits is often precondition for subsequent geodynamic investigations and belongs to the standard tasks of modern geodesy. Does the mission require a low altitude, e.g. in case of missions basically dedicated to the gravity field determination, the modelling proves to be extremely difficult. Considering a passive laser target like GFZ-1, the analyses suffers to a great extent from the small number of observations. The paper discusses a Kaiman filter approach to model the motion of the GFZ-1-satellite. This approach relies both on the integration of the Gauss equations of motion within the adopted force field as well as on the processing of current laser distance measurements, if available. In addition, data obtained from a second sensor, in particular a very sensitive CCD-camera, was taken into account. Analyzing CCD-images allows nowadays for the derivation of spherical satellite coordinates with an across-track accuracy of about +/-0.2″–0.3″ (about +/-50cm in case of GFZ-1). In the along-track direction the accuracy of about +/-0.5″ should be sufficient to improve the time-bias estimates to an order, which allows for the reacquisition to low-earth-orbiting laser targets. Simulation computations clearly demonstrate, that a network of about 7 stations equipped with CCD-cameras may bridge the geographical gaps of the laser network.